The Blue Lagoon (Icelandic: “Bláa lónið”) geothermal spa is one of the most visited attractions in Iceland. The steamy waters are part of a lava formation. The warm waters are rich in minerals like silica and sulphur. The Blue Lagoon also operates a Research and Development facility to help find cures for skin ailments using the mineral-rich water. The lagoon is fed by the water output of the nearby geothermal power plant Svartsengi and is renewed every 2 days. Superheated water is vented from the ground near a lava flow and used to run turbines that generate electricity. After going through the turbines, the steam and hot water passes through a heat exchanger to provide heat for a municipal hot water heating system. Then the water is fed into the lagoon for recreational and medicinal users to bathe in. 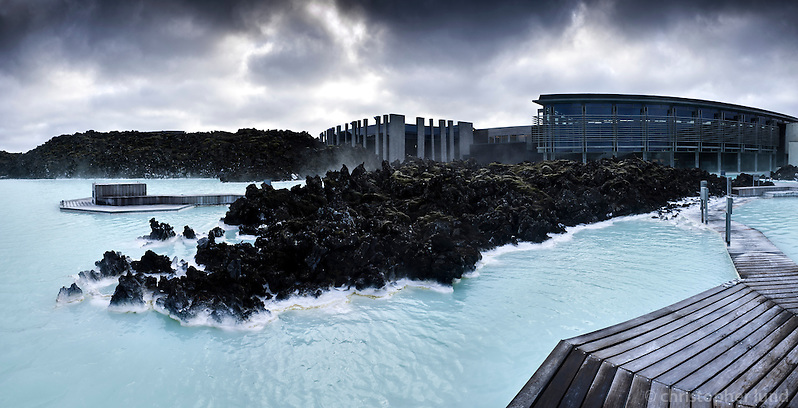 The spa is located in a lava field in Grindavík on the Reykjanes Peninsula, southwestern Iceland. Bláa lónið is situated approximately 13km (8 miles) from the Keflavík International Airport and 39km (24 miles) from the capital city of Reykjavík. Posted on Tuesday, March 15th, 2011 at 15:30. Filed under: Locations, Reykjanes, Southwest Iceland	RSS 2.0 feed.